For decades, families, parade-goers, employees, park rangers, Medora Musical cast members, and countless others have enjoyed the 4th of July holiday in this patriotic little town. 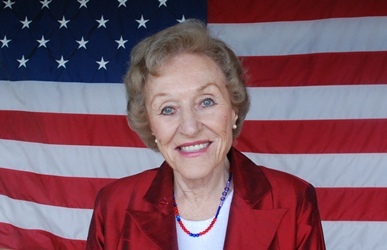 Sheila Schafer, the unofficial “First Lady of Medora”, is busy gearing up for the 4th at her log cabin home in Medora. She may be eighty-seven years old, but her calendar is jam-packed with appointments, lunches, interviews, family time, and frequent evenings watching the Medora Musical. When I stopped by this week, she was baking all-American apple pies in preparation for the arrival of several relatives over the course of the next few days. A neat row of American flags—which she proudly notes are labeled by the manufacturer “Made in the USA”—wave in the wind from her front yard flower beds. And of course, 400 ice cream bars are chilling in her freezer (…we’ll get to that later). The 400 ice cream bars await employees and volunteers who come to take in the fireworks show at Sheila’s house, the best view in town. Sheila and a crew of helpers happily hand out the ice cream to the people who keep Medora running all summer long. Around 11:15pm, members of the crowd quiet down, lie on blankets looking up at the stars, and await the dramatic artillery of a fireworks show that will light up the sky and shake the ground beneath them. Sheila (pronounced “shy – la”) is the widow of Harold Schafer, owner of the Gold Seal Company, founder of the Theodore Roosevelt Medora Foundation, and the philanthropist who lovingly poured money and energy into the rejuvenation of the town of Medora in the 1960s. Harold passed away more than a decade ago, but Sheila says she thinks about him more during the 4th of July than any other time during the summer season in Medora. “After Christmas, the 4th of July was Harold’s favorite time of year! He was very patriotic. He so honored people that served. How proud he would be that we’ve got a grandson now that just got his sergeant stripes in the National Guard.” In fact, Sheila tells that in Harold’s will, one of his wishes was that Medora continue to hold 4th of July Parades and a big fireworks show every year. When Harold and Sheila were younger, they spent 4th of July holidays riding horseback in the Dickinson and Medora parades, duded up in Roy Rogers-like apparel. Sheila is proud of the number of parade entrants Medora usually sees, saying the parades here used to be much smaller. 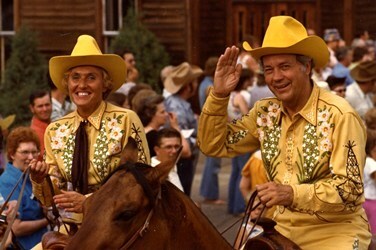 She laughs, “Bill Sorensen [of the 4-M Revue] used to joke during his show that our parade was so small, we would just park the parade and let the people walk around it! Now we get a pretty good sized parade.” Harold was also known to buy hundreds of little American flags and send Sheila downtown to hand them out to all the children on the boardwalks of Medora. This year, Harold would have been 100 years old in February. 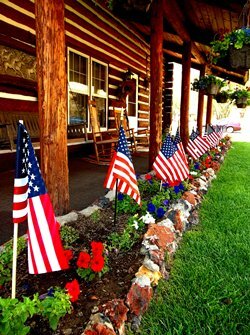 Sheila knows he would be proud of the patriotic pride still on display today, and throughout the year, in Medora.